WASHINGTON, DC, November 5, 2014 (ENS) – Voters gave Republicans control of the Senate in Tuesday’s midterm elections with a majority of 52 seats to the Democrats’ 48. The GOP also maintained control of the House of Representatives, making Congress entirely Republican. For the environment, this will mean fossil fuels such as coal and oil will receive congressional support, while renewable energy and environmental protections will be left behind. 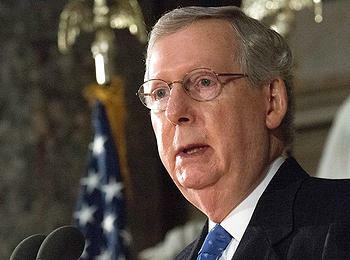 Senate Republican Leader Mitch McConnell from the coal-producing state of Kentucky has often railed against “the burdensome regulations placed on Kentucky coal jobs by the Obama Administration,” as he said on the Senate Floor September 17. Calling President Barack Obama’s policies a “War on Coal,” in the same speech, McConnell took aim at the U.S. Environmental Protection Agency’s rule to limit greenhouse gas emissions from coal-burning power plants, signalling the Republican direction when the new majority takes its seats in January. “Americans have seen a barrage of regulations and red tape from the president’s Environmental Protection Agency, strangling the coal industry, one of my home state’s most important sources of jobs and economic development. Kentucky miners and the thousands more from the Commonwealth whose jobs rely on mining are feeling the pain from the president’s efforts,” said McConnell. “Last September, I introduced the Saving Coal Jobs Act,” said McConnell. The bill was another attempt to rein in the EPA’s actions to curb heat-trapping greenhouse gas emissions. McConnell’s bill included language prohibiting any new carbon emissions standards on new or existing power plants as mandated by federal agencies without the approval of Congress. “After all, Congress – not the executive branch – is supposed to write our nation’s laws,” he said. However, the U.S. Supreme Court in June authorized the EPA to regulate carbon dioxide, the most prevalent greenhouse gas, from coal-fired power plants, but only if these sources emit air pollutants other than greenhouse gases as well. Details of the ruling in a case brought by the Utility Air Regulatory Group, will be further litigated in lower courts. 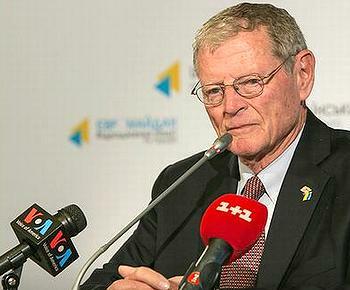 When the new Congress reconvenes in January, Republican Senator James Inhofe, an avowed climate denier who represents the oil-producing state of Oklahoma, ‎will likely head the Senate Environment and Public Works Committee. He is presently the Ranking Member of that committee. Inhofe has called climate change a “hoax” and has traveled to the UN international climate negotiations to make his views known. In fact, the IPCC is a United Nations body, founded in 1988, which evaluates climate change science. The IPCC assesses research on climate change and synthesizes it into assessment reports every five to seven years. The current IPCC assessment is the work of more than 830 coordinating lead authors, lead authors and review editors from over 80 countries, including the United States, covering a range of scientific, technical and socio-economic views and expertise. More than 1,000 contributing authors and 2,000 expert reviewers participated in the process of review and revision. With senators with such views in the majority, there is no chance that the Senate with ratify the legally-binding global treaty to limit climate change that world governments are expected to agree at the UN climate summit in December 2015 in Paris. The Republican-led Senate is expected to have the votes for a bill that would grant approval to the Keystone XL pipeline that would carry diluted bitumen from the Alberta tar sands to refineries in the United States. The pipeline still requires a Presidential Permit to cross the Canada-U.S. border after a determination that such a pipeline is in the national interest. But environmentalists are not giving up or retreating. “But don’t be fooled. This election marked a pivotal change in how candidates confront the climate crisis,” said Brune. “Even the most anti-environmental candidates were compelled to greenwash their voting records and change their tune on climate denial. The climate on climate is changing. “The next Congress will be controlled by politicians elected with millions of dollars of the Koch brothers’ oil money – putting at risk the vital environmental protections we’ve fought so hard to achieve,” said Pica. The League of Conservation Voters, LCV, found a few bright spots for the environment in the Senate election returns. The LCV spent nearly $30 million during this midterm election cycle, close to a six-fold increase from the 2010 midterms and by far the most that the nonprofit organization has ever spent. LCV President Gene Karpinski congratulated Maine Senator Susan Collins on her re-election. Collins, a Republican, “is committed to protecting our environment and expanding our clean energy economy,” he said. The LCV Action Fund endorsed Senator Collins in June. Collins’ voting record has earned her the highest score on LCV’s National Environmental Scorecard of any Republican in the Senate. Karpinski also congratulated Senator Al Franken on his victory in the Minnesota Senate race. The LCV Action Fund endorsed Franken, raised or contributed more than $100,000 to his campaign through its GiveGreen program, and named his opponent, Mike McFadden, to the Dirty Dozen. LCV mobilized its members as volunteer for Franken’s campaign, as part of its GreenRoots program. In October, LCV named McFadden to its 2014 Dirty Dozen list, which targets candidates, regardless of party affiliation, who side against the environment and are running in races in which LCV has a serious chance to affect the outcome. Representative Southerland lost his seat to Democrat Gwen Graham in Florida’s 2nd District. Ocean Champions is a 501(c)(4) organization that endorses pro-ocean Congressional candidates, runs independent expenditure campaigns, and lobbies members of Congress on behalf of the oceans. Ocean Champions PAC makes contributions directly to candidates and bundles contributions for candidates.